During the Battle of First Bull Run, the principal adversaries were the Union Army of Northeastern Virginia and two Confederate commands, the Army of the Potomac and Army of the Shenandoah. In July 1861 the Union army was organized into five infantry divisions of three to five brigades each. 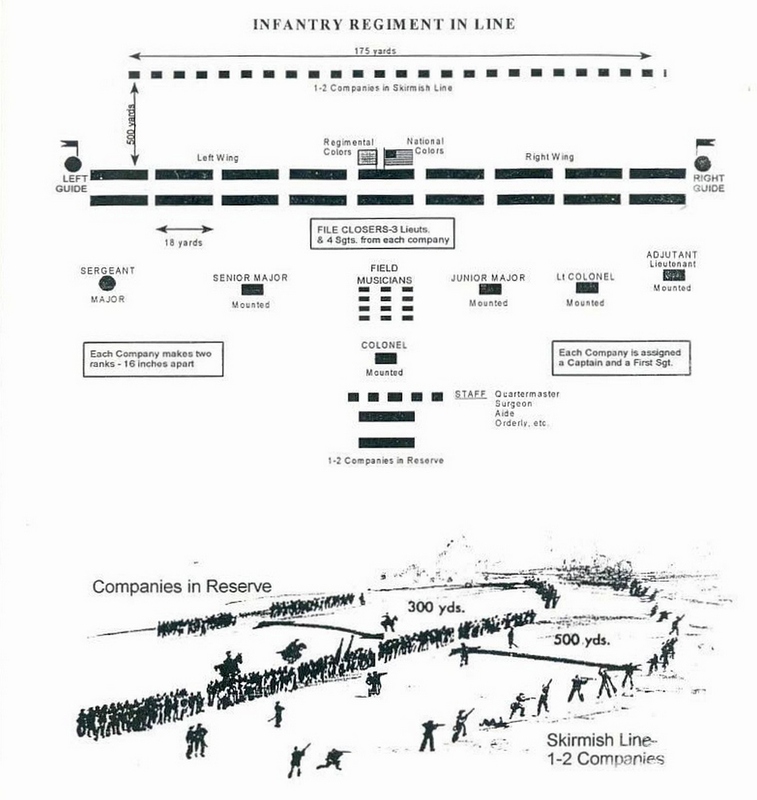 Each brigade contained three to five infantry regiments. 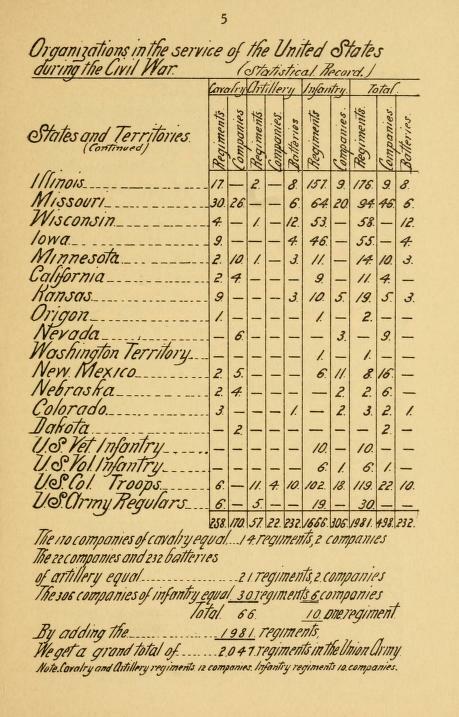 An artillery battery was generally assigned to each brigade. The total number of Union troops present at the Battle of First Bull Run was about 35,000, although only about 18,000 were actually engaged. The Confederate Army of the Potomac was organized into six infantry brigades, with each brigade containing three to six infantry regiments. Artillery batteries were assigned to various infantry brigades. 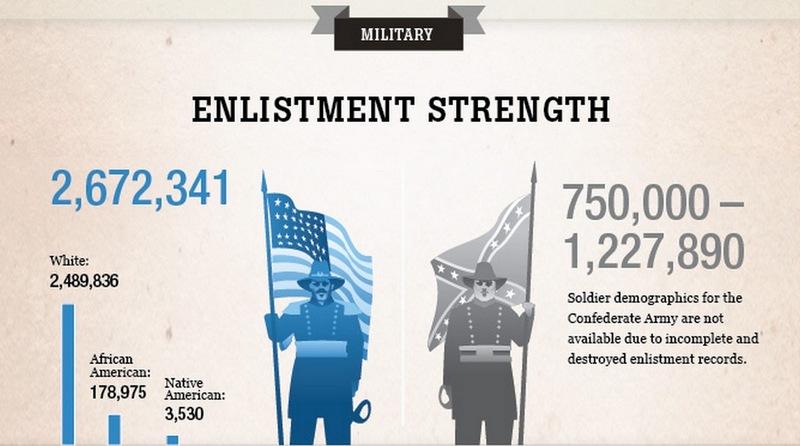 The total number of troops in the Confederate Army of the Potomac was approximately 22,000. The Confederate Army of the Shenandoah was also organized into brigades. It consisted of four brigades of three to five infantry regiments each, which totaled approximately 12,000 men. Each brigade was assigned one artillery battery. Although the combined strength of both Confederate armies was about 34,000, only about 18,000 were actually engaged at First Bull Run. Throughout the Civil War the infantry regiment was the basic administrative and tactical unit of armies. Regimental headquarters consisted of a colonel, lieutenant colonel, adjutant, quartermaster, surgeon (with rank of major), two assistant surgeons, a chaplain, sergeant major, quartermaster sergeant, commissary sergeant, hospital steward, and two principal musicians. A captain, a first lieutenant, a second lieutenant, a first sergeant, four sergeants, eight corporals, two musicians, and one wagoner staffed each company. 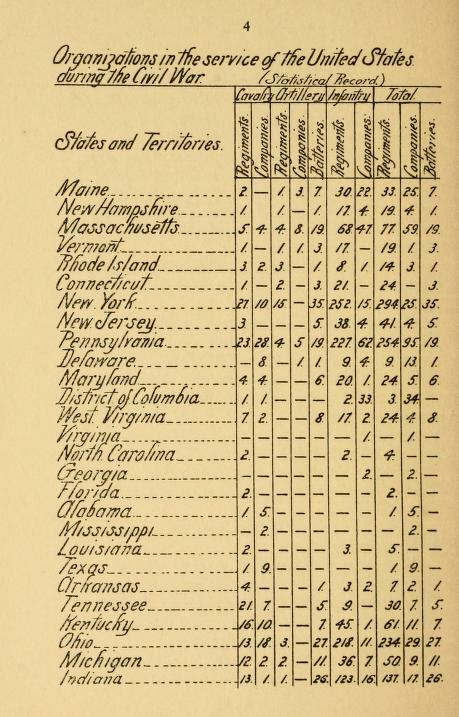 The authorized strength of a Civil War infantry regiment was about 1,000 officers and men, who were arranged in ten companies plus a headquarters and (for the first half of the war at least) a band. Discharges for physical disability, disease, special assignments (bakers, hospital nurses, or wagoners), courts-martial, and battle injuries all combined to reduce effective combat strength. Before too long a typical regiment might be reduced to less than 500 troops. Brigades were made up of two or more regiments, with four regiments being most common. Union brigades averaged 1,000 to 1,500 infantry, while a Confederate brigade averaged 1,500 to 1,800. Union brigades were designated by a number within their division, while Confederate brigades were designated by the name of a current or former commander. Divisions were formed of two or more brigades. Union divisions contained 2,500 to 4,000 infantrymen, while the Confederate infantry division was somewhat larger, containing 5,000 to 6,000 men. After First Bull Run, both sides eventually organized corps by combining two or more divisions. Two or more corps constituted an army, the largest operational organization. Sources: Official Records of the Union and Confederate Armies; National Park Service; National Archives; Library of Congress; The Union Army; Fox, William F. Regimental Losses in the American Civil War; United States Army Center of Military History; Hardesty, Jesse. Killed and died of wounds in the Union army during the Civil War (1915) Wright-Eley Co. The text is augmented by 80 black-and-white photographs and 19 maps. It is like touring the battlefields without leaving home. A must for every one of America's countless Civil War buffs, this major work will stand as an important reference and enduring legacy of a great historian for generations to come. "This stout volume covers not only the pivotal American Civil War battles, but also the bloodiest and costliest battles." Few historians have ever captured the drama, excitement, and tragedy of the Civil War with the headlong elan of Edwin Bearss, who has won a huge, devoted following with his extraordinary battlefield tours and eloquent soliloquies about the heroes, scoundrels, and little-known moments of a conflict that still fascinates America. Antietam, Shiloh, Gettysburg: these hallowed battles and more than a dozen more come alive as never before, rich with human interest and colorful detail culled from a lifetime of study. Illustrated with detailed maps and archival images, this 448-page volume presents a unique narrative of the Civil War's most critical battles, translating Bearss' inimitable delivery into print. As he guides readers from the first shots at Fort Sumter to Gettysburg's bloody fields to the dignified surrender at Appomattox, his engagingly plainspoken but expert account demonstrates why he stands beside Shelby Foote, James McPherson, and Ken Burns in the front rank of modern chroniclers of the Civil War, as the Pulitzer Prize-winning McPherson himself points out in his admiring Introduction. A must for every one of America's countless Civil War buffs, this major work will stand as an important reference and enduring legacy of a great historian for generations to come. About the Author: Edwin C. Bearss is legendary among serious scholars and Civil War buffs alike. The former Chief Historian of the National Park Service and its current historian emeritus, Bearss' renowned tours of America's battlefields feature a uniquely engaging panache that has inspired a legion of fans. He has consulted on numerous books, documentaries, and films, including Gods and Generals and Ken Burns' The Civil War. The author of 13 books, he has been honored many times for his tireless advocacy of the historical preservation of Civil War battlefield sites. Also available in hardcover: Fields of Honor: Pivotal Battles of the Civil War . Recommended Reading: The Civil War: A Narrative, by Shelby Foote (3 Volumes Set) [BOX SET] (2960 pages) (9.2 pounds). Review: This beautifully written trilogy of books on the American Civil War is not only a piece of first-rate history, but also a marvelous work of literature. Shelby Foote brings a skilled novelist's narrative power to this great epic. Many know Foote for his prominent role as a commentator on Ken Burns's PBS series about the Civil War. These three books, however, are his legacy. His southern sympathies are apparent: the first volume opens by introducing Confederate President Jefferson Davis, rather than Abraham Lincoln. But they hardly get in the way of the great story Foote tells. This hefty three volume set should be on the bookshelf of any Civil War buff. --John Miller. Continued below. Recommended Reading: For Cause and Comrades: Why Men Fought in the Civil War. Description: Professor James McPherson posits that the common rank-and-file soldiers did indeed hold political and ideological beliefs that prodded them to enlist and to fight. His research is based on letters and diaries from 1,076 Union and Confederate soldiers that reveal many motivations, but always lead back to duty, honor, and a cause worth dying for. For Cause and Comrades is a fascinating exploration of the 19th-century mind--a mind, it seems, that differs profoundly from our own.